1. Empty the dishwasher. Cleaning the dishwasher while it is full just won’t work. 2. Remove the racks and and other compartments that can be removed from the inside of your dishwasher. 3. Wipe the bottom of the door and any dishwasher grates that you might have (the bottom part underneath the door). Often times dust and crumbs will accumulate here because water cannot reach there. 4. If you have a filter in your washer, it’s a good idea to clean it periodically. 5. Wipe the door seal and by soaking a cloth in vinegar, then wipe around the door seal. Make sure to get into the small areas with a toothbrush or Q-tip also soaked in vinegar. 6. Clean the utensil rack with a soapy toothbrush or dish brush. Then rinse and wash off the top and bottom racks of your dishwasher and put them back into the dishwasher. 7. Run an empty cycle with vinegar, this will help to remove hard water deposits and clean any other areas you may have missed during your cleaning. 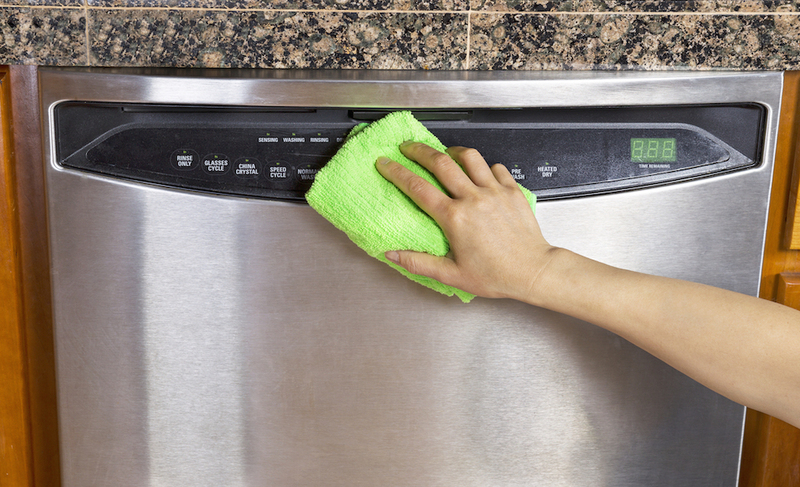 You can add 2 cups of vinegar to the bottom of the dishwasher and run the dishwasher. Stop the dishwasher halfway through the cycle, and let the vinegar stand on the bottom for about 20 minutes. Turn on and complete the cycle. * Please note that vinegar is acidic and should be used with caution. 8. Clean and polish the exterior, sides, and all buttons on the panel with a cleaner that is made for the type of surface that your dishwasher has, such as a stainless steel cleaner or an all purpose cleaner. 9. You’re all done! Repeat once a month or as needed. Now it is time to move on to other tasks in your home.